A great product, the Orgone Mobile Phone Harmoniser is designed to neutralise the noxious radiation emissions from all types of mobile phones, Wi-Fi systems, laptops, iPads and iPods. All models of mobile phones and Wi-Fi enabled devices emit an EMR field which may be a potentially harmful positive charge frequency. EMR emitted from a mobile phone while in use, or when placed in a pocket or handbag, may create electromagnetic stress on the vital life-energy of human organs and meridian channels. Anyone close to a mobile phone may be immediately under electromagnetic stress. This includes babies, children (playing on iPads and tablets), teenagers and adults. All types of mobile phones including iPhones etc. 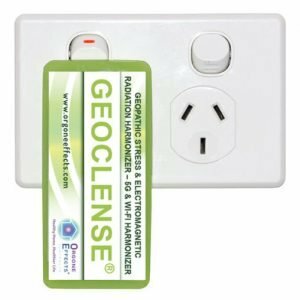 The Orgone Effects ® Mobile Phone Radiation Harmoniser creates a healthy, negative charge energy field that neutralises the harmful, positive charge energy field emitted from mobile phones, laptops, tablets, cordless phones, iPads, Wi-Fi Hotspots and Wi-Fi modems, potentially neutralising the harmful resonant effect on human organs and meridians. In addition, our Mobile Phone and Wi-Fi Radiation Harmoniser is unique in its ability to potentially provide further EMF protection from the effects of other EMR fields i.e. Earth Radiation (Geopathic Stress) and Bioplasmic Radiation (Human Generated). Do you feel sick, dizzy or have a hot head while using your mobile phone and being surrounded by technology? Noxious energy emitting from a mobile phone may cause ‘Hot Head syndrome’ when talking for a prolonged period. The most frequent complimentary feedback our customers give us is the relief from discomfort they once felt when talking on their mobile phone. Our health is affected by the noxious energy beam that is transmitted between the mobile phone, laptop and Wi-Fi system to the communication tower or modem. The danger is heightened if you are positioned in the direct path of the energy beam communicating between the phone/laptop or Wi-Fi and the tower or modem. This noxious energy beam penetrates the cells around your head and body, thus affecting your well-being. So for those people that spend much of their day on the phone, from business people to teenagers and children playing on phones and tablets, this can only be a positive step in caring for their health. The Orgone Mobile Phone & Wi-Fi Radiation Harmoniser has been tested and proven for effectiveness by Accredited Kinesiologists and Bioresonance practitioners worldwide. The Phone Harmoniser is flexible and universal in its use, meaning it can be used on all devices including those with compound curves i.e. DECT/cordless phone. The Mobile Phone Harmoniser has a strong self-adhesive backing so it can be adhered to the back of the mobile phone or onto any portable wireless device. Alternatively, as the Mobile Phone Harmoniser will last forever, place the square wafer on the back of the phone between your protective cover so it is easily transferable when you upgrade your phone technology.